Scrawny. Short. Ugly. Fat. Weird. 30% of school kids worldwide are bullied each year and bullying is the #1 act of violence against young people in America today (Source: nobully.org). The BURGER KING ® brand is known for putting the crown on everyone's head and allowing people to have it their way. Bullying is the exact opposite of that. So the BURGER KING ® brand is speaking up against bullying during National Bullying Prevention Month. 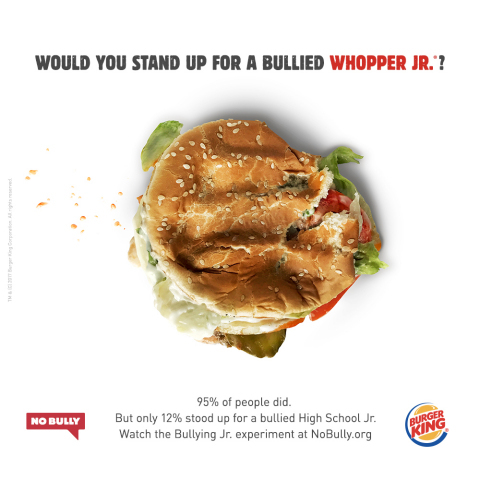 To help spread awareness, the BURGER KING ® brand created an eye-opening campaign, called "Bullying Junior" that brings the issue even closer to home with an experiment that took place in a BURGER KING ® restaurant. First, a high school junior was bullied by friends (all actors); and then a WHOPPER JR. ® sandwich was bullied - punched, smashed, destroyed, and then served by a staffer (also an actor). 95% of the real-life customers reported their bullied WHOPPER JR.®, which was noticeably roughed-up badly upon unwrapping. But, only 12% reported the high school junior who was being noticeably bullied right in front of customers' faces. While he was helplessly harassed by his "friends" both emotionally and physically, not many people were willing to take a stand. The outcome was shocking, and unfortunately, not so shocking at the same time. "We know that bullying takes on many forms, physical, verbal, relational and online. But the first step to putting an end to bullying is to take a stand against it," CEO and Founder of NO BULLY ®, Nicholas Carlisle. "Our partnership with the BURGER KING ® brand is an example of how brands can bring positive awareness to important issues. You have to start somewhere and they chose to start within." Bullying Junior can be viewed at www.youtube.com/burgerking. To take a stand against bullying, visit www.NoBully.org. Founded in 1954, the BURGER KING ® brand is the second largest fast food hamburger chain in the world. The original HOME OF THE WHOPPER®, the BURGER KING ® system operates more than 15,000 locations in approximately 100 countries and U.S. territories. Almost 100 percent of BURGER KING ® restaurants are owned and operated by independent franchisees, many of them family-owned operations that have been in business for decades. The BURGER KING ® brand is owned by Restaurant Brands International Inc. (TSX,NYSE:QSR), one of the world's largest quick service restaurant companies with more than $27 billion in system-wide sales and over 23,000 restaurants in more than 100 countries and U.S. territories. To learn more about the BURGER KING ® brand, please visit the BURGER KING ® brand website at www.bk.com or follow us on Facebook and Twitter.